Duffy’s Bar & Grille Chicago and WrestleZone present…. If you are a WWE fan in or around the Chicago area then Duffy’s Bar & Grille (an official WWE Blast Area) will be your place to watch this year’s WWE WrestleMania 34! Including an exclusive VIP Kick-Off Show Party hosted by WWE Hall of Famer Mick Foley! 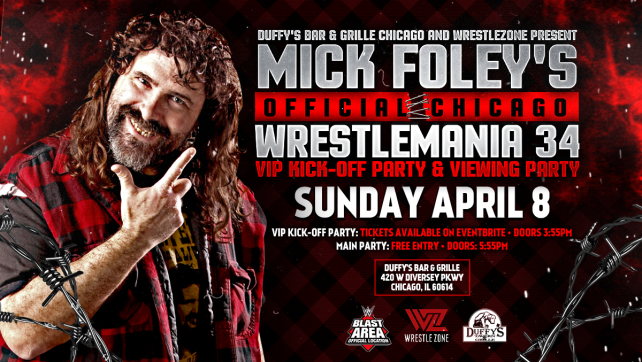 Mick Foley’s Official Chicago WrestleMania 34 VIP Kick-Off Party will be limited to 80 fans. These fans will be allowed into Duffy’s main room early for Mick’s VIP WrestleMania 34 Kick-Off Party and will be guaranteed seats for the full WWE WrestleMania 34 Viewing Party. 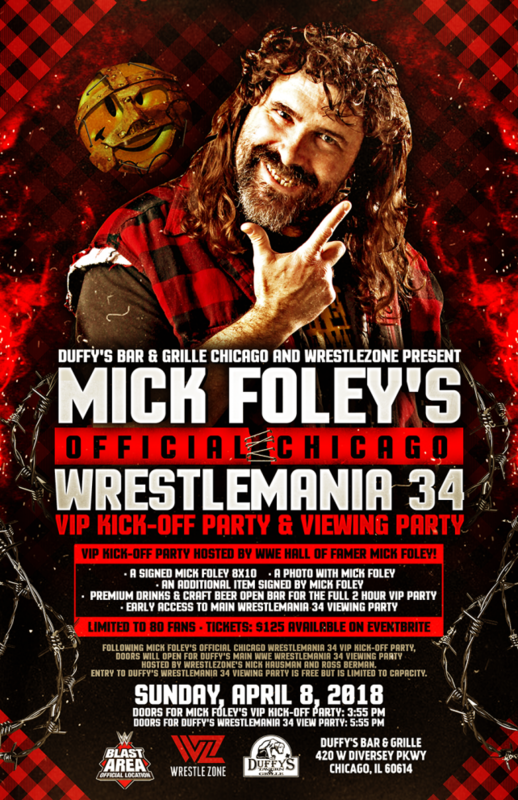 Following Mick Foley’s Official Chicago WrestleMania 34 VIP Kick-Off Party doors will open for Duffy’s main WWE WrestleMania 34 Viewing Party hosted by WrestleZone’s Nick Hausman and Ross Berman. Entry to Duffy’s WrestleMania 34 Viewing Party is free but is limited to capacity.